Well it started when my son purchased a 2005 Suzuki Boulevard, he loved it. He wanted to buy a Harley Davidson but they were out of his price range. Not long afterward I received my custom chopper that was built at Monterey Choppers in Monterey Ca. He replaced the rear fender with an old style Harley fender, and cut a slot for the tail light at the bottom. We then took his bike apart, replaced the front triple tree with a new one. It was a 35 degree rake also new head light, foot pigs, exhaust pipes, Ram induction, Handle bars, and many more features. Now he loves his new metric chopper. It's very nice and very fast. 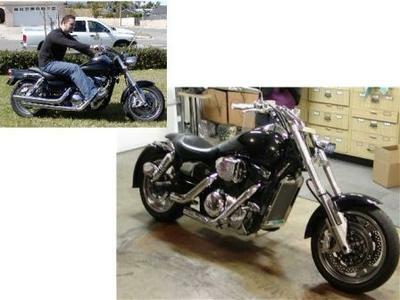 Here are some pictures of his bike before and during the rebuild. The finished product of our bikes are never finished, are they? Hope you like the pictures and story. P.S. my son and I do a lot of riding and we do most of it together witch is very cool and friends also come along.